Joe Leisner, the charming owner of New York comic book store Comic Book Heaven, prepares to close his shop after 60 years in the business. 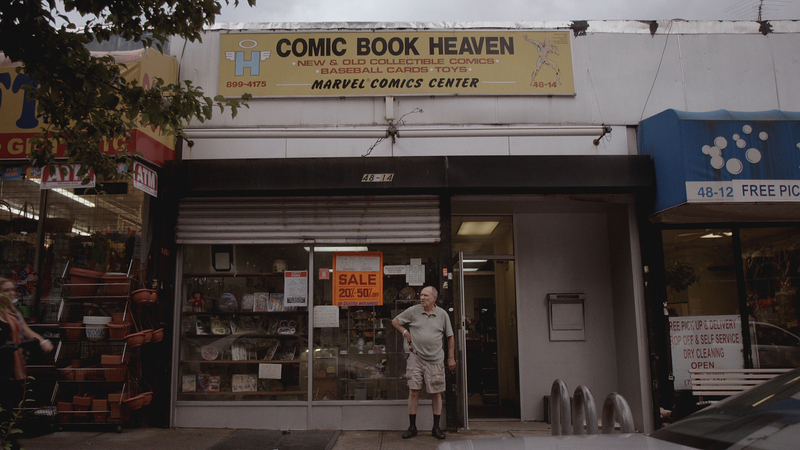 Comic Book Heaven is the story of Joe Leisner, the lively, highly opinionated and vocal owner of Comic Book Heaven, a comic book store in Queens. Joe’s store has been a fixture in Queens for over 60 years and he’s ready to retire. Director E.J. McLeavey-Fisher paints a marvelous cinematic portrait of Joe, perfectly capturing the raw essence of this spectacular character. Even if you are not a dedicated fan of comic books, it’s difficult not to be won over by the charm of both Joe and his store. If there ever were a person who could make comic books feel genuinely badass, Joe Leisner is the man to do it. His classically old school mentality has an oddly old west appeal which McLeavey-Fisher echoed with his sound choices. One of the many aspects that makes this film interesting is the sense of discovery. It’d be easy to be fooled by a sense of nostalgia, but what the store represents is a great opportunity for discovery, and not only for the customer, but for the viewer and filmmaker as well. Part of this can be attributed to the fact that, in a sense, the film in itself was a working discovery for the director. When asked what inspired him to make the film McLeavey-Fisher tells us “I’m always trying to shoot local stories – not just NYC but in my area of Queens, specifically. I saw an article about Comic Book Heaven going out of business and stopped by the store to see if there might be a story there. In my head I was imagining it would be a quick 3 minute piece about the store going out of business that month, but upon meeting Joe and seeing what a character he was, I knew there was more to it.” His lack of familiarity with the subject prior to filming certainly complimented the perspective of curiosity embedded within the execution of the film. When we watch a film such as this we are quickly reminded of what a great cultural loss the closure of businesses such as these can be. While it’s easy to say the businesses are changing and evolving to become more efficient and productive, it’s impossible to deny the value of stores such as these. Being able to walk into a comic book store, a book store, or a video store and physically discover new(or old) and exciting things is truly a great loss. In many ways the film allows us, as viewers, to reflect on our own contributions to the declination of bookshops and wind up with a great urge to engage and participate more in the local businesses of our great communities and trying to keep certain traditions alive while allowing them to simultaneously evolve to touch us all. In the same way we don’t want Joe to close his store and maintain not only his legacy but the legacy of the comic book establishment, we don’t want the film to end.